Phoebe Waller-Bridge’s sexually frank, fourth-wall-breaking dark comedy Fleabag, which launched on Amazon Prime Video in 2016, stars the writer-producer as a self-centered Londoner awkwardly navi­gating encounters with men, friends, and family while grieving the loss of her best friend. Never has a funny woman on TV also been so deeply bitter, lonely, and sad—or so intimately connected to the viewer. Waller-Bridge, who starred in and wrote another British sitcom in 2016 called Crashing (now on Netflix), is currently writing a second season of Fleabag and a spy thriller for BBC America. She is also, in a sign of emerging clout, voicing a character in the upcoming Star Wars spin-off about Han Solo. 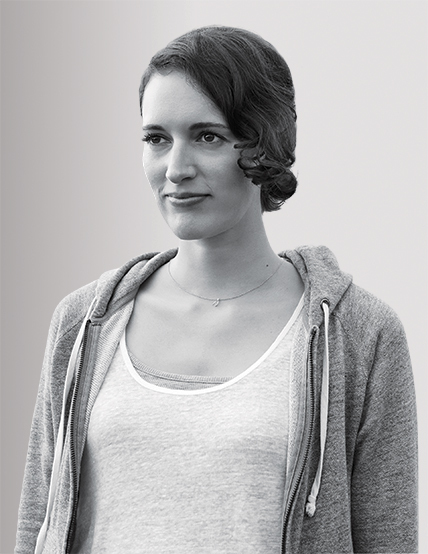 Fleabag began as an award-winning, one-woman stage show in 2013. How does your theater background contribute to Fleabag’s unique tone? "I learned a discipline in theater where no word can be wasted and there’s no space for making an audience wait for a plot point. It was great training for making sure the audience comes first. You can’t take them for granted." The show’s main character desperately needs to connect with someone, and the audience is the only one listening. She speaks to us like a confidante, revealing intimate details of her life—except her actual name. "I didn’t want her to have a name because I wanted her to be every woman. And that complicity with the audience is essential to her; it’s the most authentic relationship in her life. You, the viewer, are the one that she can be herself with—as shameless and filthy and dangerous and desperately sad as she wants to be. " One of the revolutionary things about Fleabag is that it contains so few female stereotypes. The character is beyond gender in many ways. Was that a conscious effort? "I wanted to make something I hadn’t seen before. The thing I most enjoyed about writing Fleabag was the chance to subvert expectations. People construct aspects of their personalities to protect themselves from pain and vulnerability. With a lot of male characters, the front and the ego are a given before the mask slips and we get a glimpse of the sensitivity beneath, but I hadn’t seen that in portrayals of female characters—which is ironic considering how women create the most soph­isticated personas on a daily basis just to avoid being humiliated, patronized, or labeled. It runs so deep I think we forget that we’re doing it sometimes."